Saint Paul is upgrading its recycling program! Saint Paul will be delivering new single-sort recycling carts to your home from November 28, 2016 - January 14, 2017. 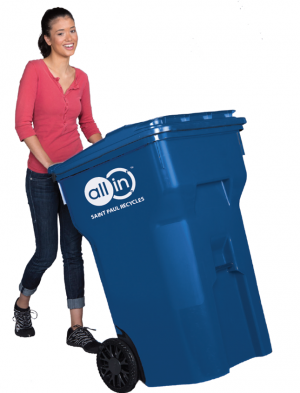 The blue carts have wheels and a lid to make it even easier for you to collect your recyclables.There's no need to sign up - the cart will be delivered to every household in the City. You may begin using the cart on January 16, 2017. How big is the cart? 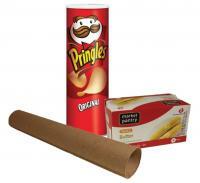 All households will receive a 64-gallon cart. Please use this cart for 90 days while we complete the cart transition. 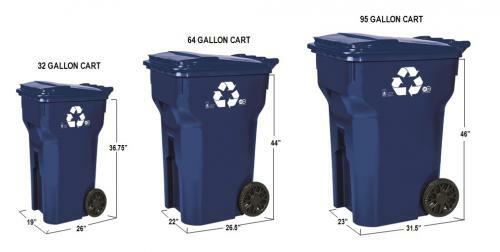 Starting in April, if you would like to try a smaller (32-gallon) or larger (95-gallon) cart you may request a switch by calling Eureka Recycling at 651-222-7678. One switch will be allowed at no charge. See this chart for a full spectrum of cart sizes and their dimensions. Do I have to pay for the new cart? There is no additional cost for the cart - all City households pay for recycling services through an annual fee on your property tax. What should I do with my old curbside bin? Most neighborhoods will experience a collection day change, starting January 16, 2017. More information is detailed below under Collection Day Changes. 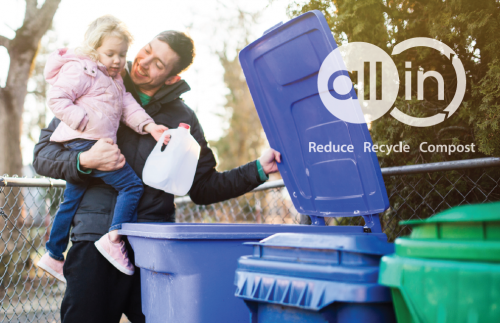 Starting January 16, 2017, residents with accessible alleys will have their recycling picked-up from the alley. 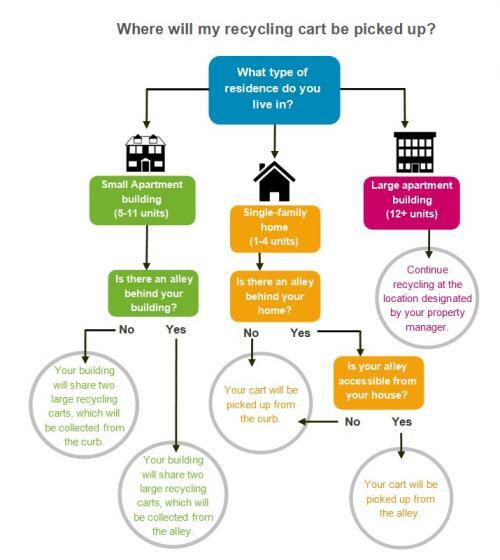 Still not sure where your recycling will be collected? Use diagram below or call 651-266-6199. For a complete list of materials accepted for recycling, download the 2016 Residential Recycling Brochure or check out our Residential Recycling page. 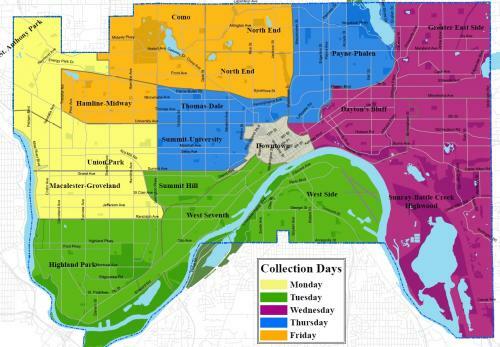 The majority of Saint Paul neighborhoods will experience a collection day change. This change will take effect on January 16, 2017, along with the start of collection from recycling carts. View this map to find out your collection day, effective January 16, 2017. All residents will also receive a postcard in early January with a collection day change reminder. Small apartment buildings that have 5-11 units will share two large (95 gallon) recycling carts. Similar to your garbage collection, the recycling cart will either stay in the alley or will go out to the curb on your recycling day. If your building does not have an alley, be sure that the person responsible for setting your carts at the curb knows your new recycling collection day. Large apartment buildings that have 12 units or more will continue recycling in the same location as designated by their property manager. If your building does not currently offer recycling, contact Eureka Recycling at 651-222-7678 to set up service.